Extreme Prophetic Studies, what every prophet needs to know when entering the prophetic ministry. This intensive online prophetic ministry training is designed for prophets, those who want to get started in prophetic ministry, and those who desire to advance in hearing from the Holy Spirit. The subject of prophets, prophecy, and prophetic ministry is so vast that no single teaching could discuss every facet. Extreme Prophetic Studies online prophetic ministry training course is designed to lay vital foundational truths that provide firm points of balance while going into the depths of the prophetic. The prophetic ministry is just as vital today as it was in Old Testament times. The Apostle Paul validated prophecy in his letter to the church at Corinth writing, “Therefore, my brethren, desire earnestly to prophesy…” (1 Corinthians 14:39). The lessons in this online course are carefully designed for those called into prophetic ministry as well as Spirit-filled believers that want to flow in this important, unique, and distinctive grace. Students become effective in hearing from God and more accurate in releasing prophetic utterances. Intensive study on the New Testament ascension gift prophet. Explore the scope of prophecy, prophetic utterance, and prophetic ministry. Learn how to judge personal and directive prophecy. Understand the role of prophetic announcements and decrees. Learn about the prophet’s unique calling and extensive training process. Be trained to cooperate with the Holy Spirit's various prophetic flows. Discover wide range of prophetic operations. Gain greater understanding of different forms of prophetic communication such as dreams, visions, words of knowledge, words of wisdom and much more. Understand the important purpose and place of prophetic ministry in New Testament churches. Learn how to identify true and false prophets. Download thirty-six prophetic class lessons, audio teachings, and reading assignments in digital format to keep in your personal library. Receive an Apostolic Equipping Institute prophetic ministry certificate suitable for framing after completing the course. 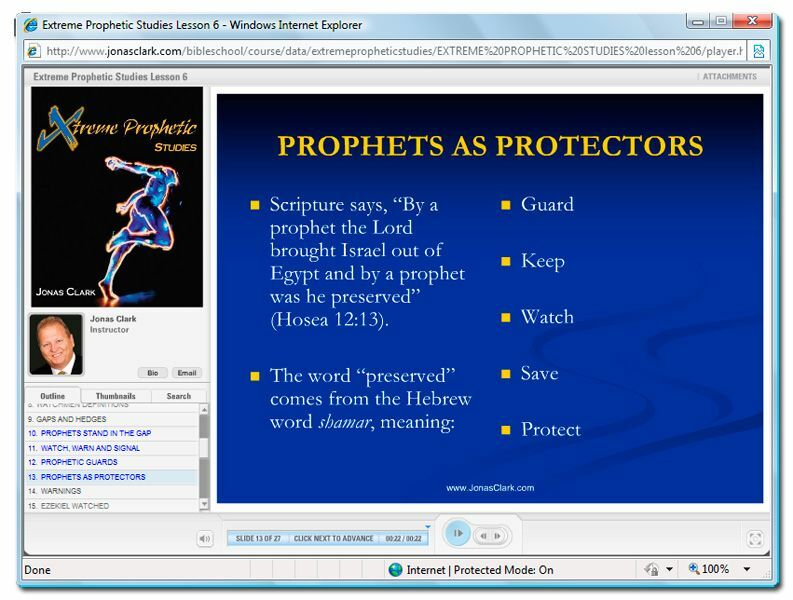 Extreme Prophetic Studies online prophetic ministry training course includes thirty-six prophetic class lessons, audio teachings and reading assignments to help you catch the spirit of the module with online quizzes that monitor your progress and understanding of each lesson.